I'm not sure how I feel about this but a friend of mine sent me this with the caption "This is you." And the horrible thing is he's right. So go ahead, check it out, stare into my heart. 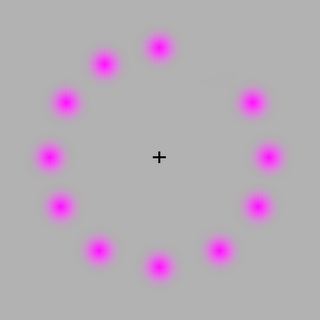 If your eyes follow the movement of the rotating pink dot, the dots will remain only one color, pink. However if you stare at the black "+" in the center, the moving dot turns to green. Now, concentrate on the black "+" in the center of the picture. After a short period, all the pink dots will slowly disappear, and you will only see only a single green dot rotating. It's amazing how our brain works. There really is no green dot, and the pink ones really don't disappear.